Okay, so this dish doesn’t look like much. Admittedly, it kind of fell apart in the pan on me. Probably a little too much filling. But hey, it was breakfast, I was half-asleep and I was very hungry. I didn`t care how it looked, so long as it tasted good. The point of sharing this? That breakfast doesn’t have to take a lot to throw together. Just grab some leftovers from the night before, fry ’em up and throw in the egg to make an omelette out of it. For this one, I used some of the leftover fajita filling, a bit more seasoning (for the egg) and a bit of cheese. You could take it a step further and serve this with salsa and sour cream on the side, too, depending on how spicy the meat mixture is, your tastes, etc. Frankly, I was too hungry to get that fancy. And despite it looking like the dog’s dinner, it was very, very tasty and satisfying. What do you put in your omelettes? I’m always looking for new ideas! 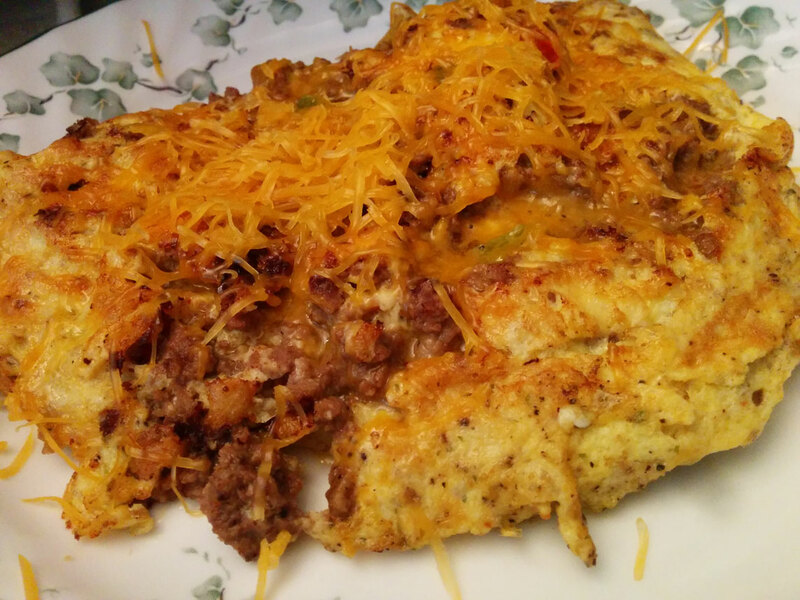 This entry was posted in Breakfast, Carb-friendly foods, leftovers, Lunch, one-pot-wonders, quick meals, quick-and-easy, stove-top and tagged cheddar, cheese, eggs, fajita mixture, omelette. Bookmark the permalink.